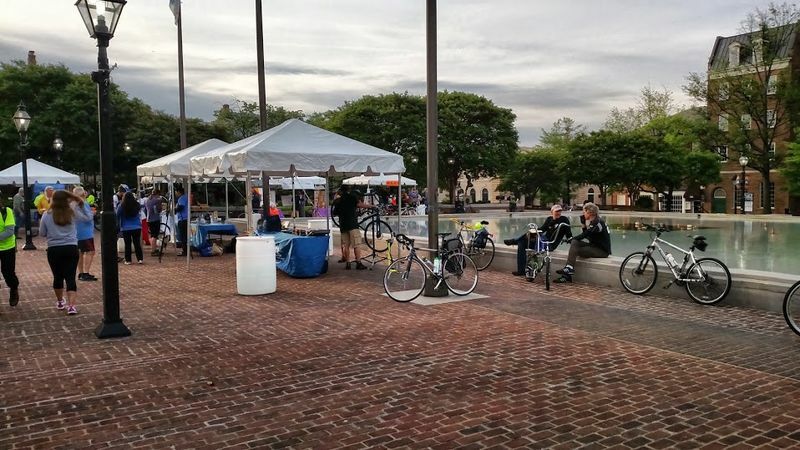 Every May the bike community has its biggest event of the year, Bike to Work Day. I have been a regular attendee, more often than not, every since I started commuting in earnest many years ago ... I have a whole wardrobe of t-shirts to prove it! The event is always a fun time, even when the weather doesn&apos;t cooperate, as it failed to do last year when I got to ford some flooded areas with water a foot deep. This year was much more pleasant with temperatures in the upper 50s to mid 60s, mild winds, and many cyclists out on the roads and trails. I made it a point to get up early this morning so that I could have time to explore a few pit stops, hopefully see some friends, and enjoy the festivities. My first stop was in Alexandria, Virginia, where I have stopped many years in the past. This year there was coffee from Misha&apos;s, donuts from Sugar Shack, and many informational booths from the likes of WABA and LocalMotion. I had a good chat with the folks at WABA, enjoyed my coffee and donut, and continued on toward the District. 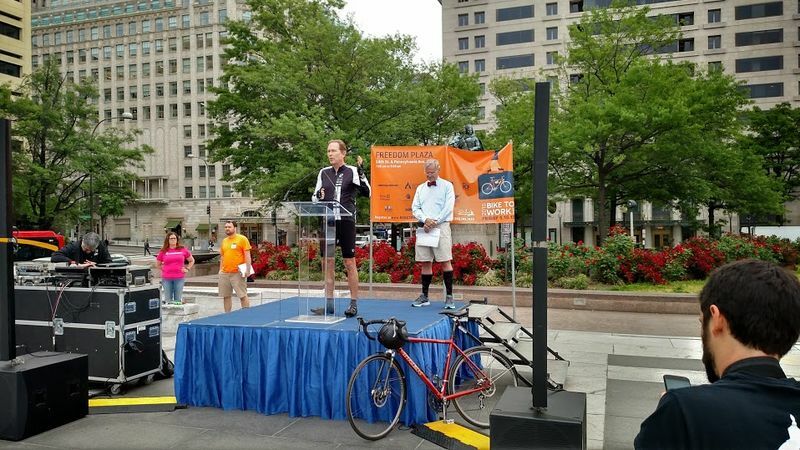 My next stop was a slight detour off the Mount Vernon Trail to Crystal City Bike to Work Day Pit Stop. Here there were bananas, bagels, Corner Bakery Coffee, granola, and a few informational tables. I had another hit of java (not quite as good as Misha&apos;s, but still pretty delicious) and half a banana (they had them pre-sliced) and then took back to the trail. After a few minutes at each pit stop, it was getting a bit later in the day, so the number of cyclists on the path took a rather dramatic up-tick. 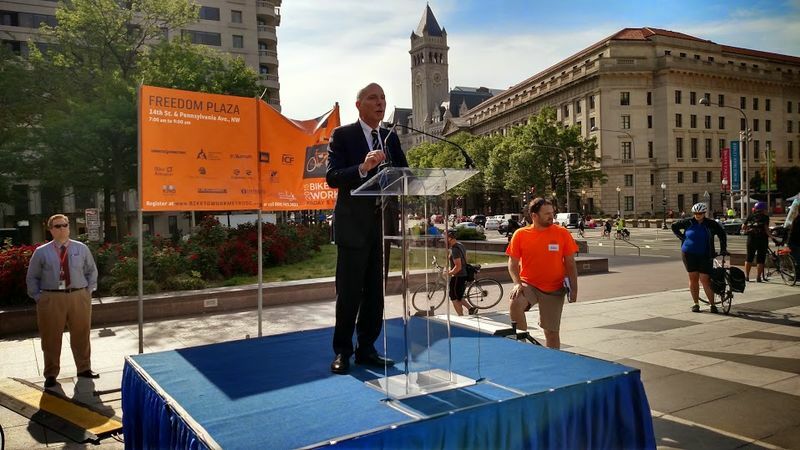 Next up was the location where I registered for my t-shirt, the Freedom Plaza Pit Stop in downtown DC. Years ago, this used to be the only real pit stop downtown. Now there are somewhere in the neighborhood of 80 in the region. While this makes it easier for people to have a stop near their place of work, it does have the downside of spreading out everyone so that you&apos;re less likely to see your friends while you&apos;re there. That said, there were still plenty of people at this pit stop. Being the traditional biggest stop of Bike to Work Day you tend to get some heavy hitters come down to speak to the assembled masses. This year included U.S. Representative Earl Blumenauer, U.S. Representative Vern Buchanan, and DC Council Chairman Phil Mendelson. I got a chance to speak to Representative Blumenauer and discussed the possibility of the National Park Service maintaining the Mount Vernon Trail in the winter like they do the adjacent George Washington Parkway, he agreed that it would be a good thing to do. 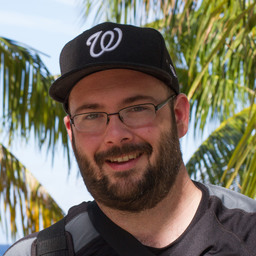 I also spoke to Greg Billing of WABA about it, who has a meeting with the George Washington Memorial Parkway staff next week and has that very issue on the agenda. With any luck, maybe things will change for the better. Advocacy aside, it was a fun pit stop. I got to see a friend from the Friday Coffee Club, got another banana, a KIND bar, another Corner Bakery coffee, and an ice cold cup of water from DC Water. After all the giveaways were done I headed on to work, where I was happily greeted by one last pit stop, right in front of the office. 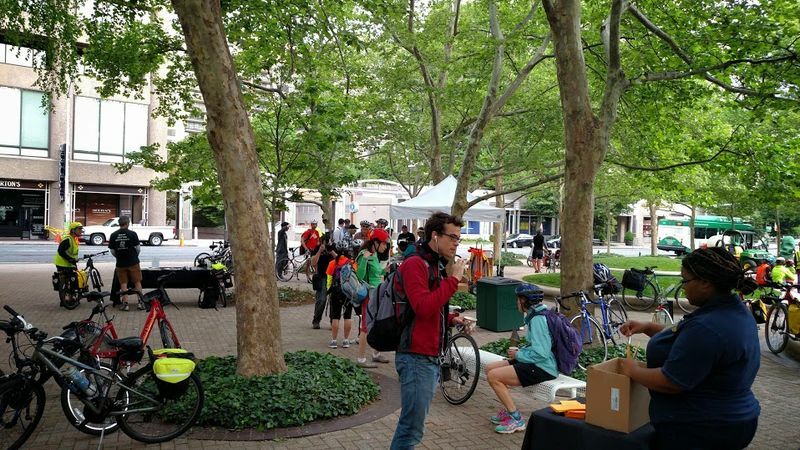 After a having a bottle of water and getting some free bike gear, I headed in to get to the work part of Bike to Work Day. Almost every day is Bike to Work Day for me -- riding in this morning put me over 1,700 miles for this year. 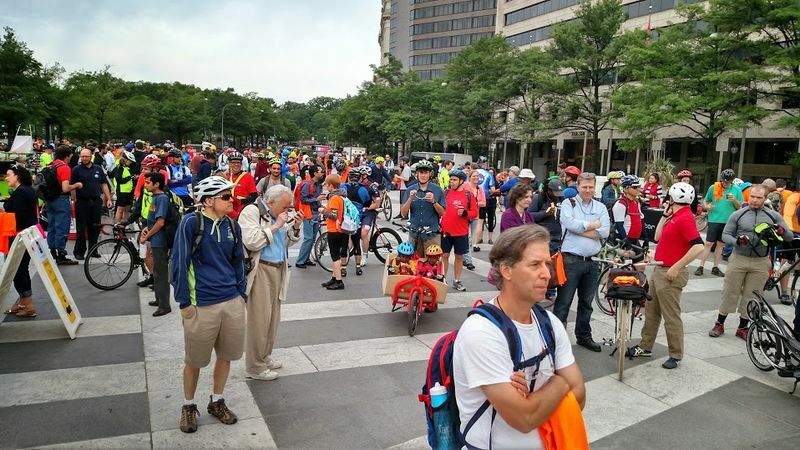 It is fun to see what it could be like if even more people decided to get out of their cars, out of the buses, and onto two wheels. Maybe a few of them will stick with it. At the very least, I hope it will make those using other modes of transportation more courteous and accepting of those on a bike. While we still have a long way to go, things have improved dramatically over the last decade. I definitely look forward to more progress ahead.